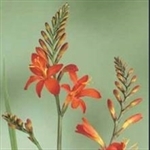 With tall spikes of flared flowers in bright colours, these plants are reminiscent of gladioli, but with much more refine, smaller flowers. They soon make good clumps, each corm replaced yearly by several new ones, so that they give good splashes of colour, against the background of tufts of slender leaves. It is good to lift and split clumps after about four year, to encourage flowering. Early flowering, with bright orange-red flowers.